This post written by Ashoka Mody. This entry was posted on February 1, 2019 by Menzie Chinn. Could we do one more post: exactly HOW does China’s M2 pump up everything whilst ECB money went down the drains? What’s THE MECHANISM? Zi Zi – start your own blog. These comments of yours are both juvenile and just pointless. This is a rare moment I will semi-defend Zi Zi. I have my own blog and occasionally make comments there if I get super-worked up about something, or want to use vulgarity or words I know most bloggers wouldn’t allow or would filter. Let’s say, of the Katie Roiphe, Camille Paglia, or Laura Kipnis category of scribblings. But I have to say, as someone with an actual blog that comments on OTHER people’s blogs, it’s much funner to make crass and jaded comments when you know they will actually be read. Zi Zi Excellent question. The answer is two-part. Read Mody on the first. He is a go-to expert on what’s happening to Europe. Europe is irreparably culturally and economically divided. Tied by an unworkable common currency that’s strangling the Southern periphery countries. Putting Italy and Greece especially in a hopeless downward spiral whereby the better-educated, entrepreneurially-able, hope-of-the-future youth are fleeing. China on the other hand is culturally one. As long as the CP rules, China is also unified economically. China leverages an internationally low wage base, steals intellectual property rights and technology from multinationals domiciled here in the US, and lavishly provides credit (M2) to its export industry to utilize the fruits of its pirating. The shabby tier of Chinese export goods is gobbled up in US Walmarts by illicit immigrants and welfare types who vote taxes onto those who actually do the nation’s work. Ironically, those who have lost their jobs to the hollowing out of America are also driven to the Walmarts in a lesser, additional, yet very real loop of downward spiral. This China pipeline generates an all-in trade deficit of around $350b that cumulatively indebtens the US more each passing year, erodes our manufacturing base potential (present and future! ), and in fact helps multiculturate Western Civilization so that it collapses, just as does the flow of illegals across the US Southwest border. At deeper root the takedown of Western Civilization is what this is all about. Read Mujahid Kamran, The International Bankers, World Wars, I, II, and Beyond on this the larger story. I noticed neither you nor Zi Zi provided any data on China’s M2. So both of you are just babbling sine a shred of evidence. Two more commenters who rant about things they have no clue about! But if we pay attention to M. Kamran, we can find out who shot JFK. Maybe even who shot J.R. Ewing. Always good to know you can get the scoop on evil international bankers—and the fall of western civilization— from a physicist from Pakistan. Likely the “multiculturating” of this country was irreparably damaged in the 19th century when lots of Irish, Italians, Poles, Czechs, et. Al., flowed across our borders. Never underestimate the negative effects of all those Catholics and Jews on the “uniculture “. And how about those Chinese and Japanese? What were their accomplishments? One bright spot: the “unculturating” of the American West where we showed Mexicans and the native peoples who was boss. Thanks, JBH, for the swell history lesson. There’s some evidence that the -0.40% interest rate on excess reserves charged by the ECB to member banks operates as a tax that perversely reduces economic activity rather than encouraging it. Three words one might have wanted to see: demographics, oil, tariffs. Oil prices are becoming less and less of a barometer than they once were. If you haven’t seen that then you’re not paying attention. This is another reason why donald trump’s homage to Saudi Arabia and donald trump’s worshipping at the feet of Saudi Arabian royalty strongly hints at more seedy underlying reasons. I wonder if Tillerson enjoys looking at these old dance videos of him after being curb-stomped by donald trump?? It’s always worth it, giving away your own personal integrity to “run with the big dogs”, eh Rex?? Rex?? Don’t you agree Rex?? Where’d Rex go……?? Interesting point about what ISN’T here, Mr Kopits. Demographics are a flock of very large chickens that are only just arriving; oil & tariffs aren’t important enough to move the needle much. Also missing from the discussion are “immigration” (which I’m guessing is in the oil&tariffs bin of interesting but not really big deal) and [drum roll] “wealth concentration”. ALL of the productivity gains for nearly FORTY YEARS in the U.S. have been commandeered by the elites leaving nothing but credit and population growth to stimulate the consumer behemoth. In Europe and Japan, demographics have very much arrived, and also to a lesser extent in the US. 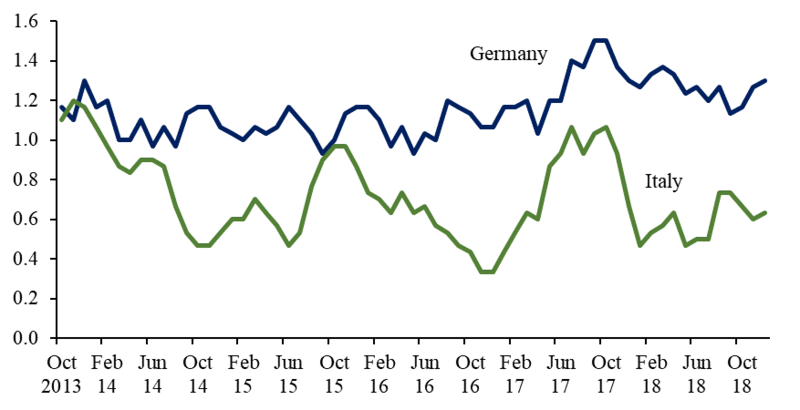 I mention tariffs because European industrial production appears to fall off just about when US tariffs were implemented. I don’t know what Abenomics is expected to achieve when the Japanese workforce is falling as fast as productivity gains. The appreciation of the dollar against the Euro from mid-2014 is all about surging US oil production and the collapse of the oil price. 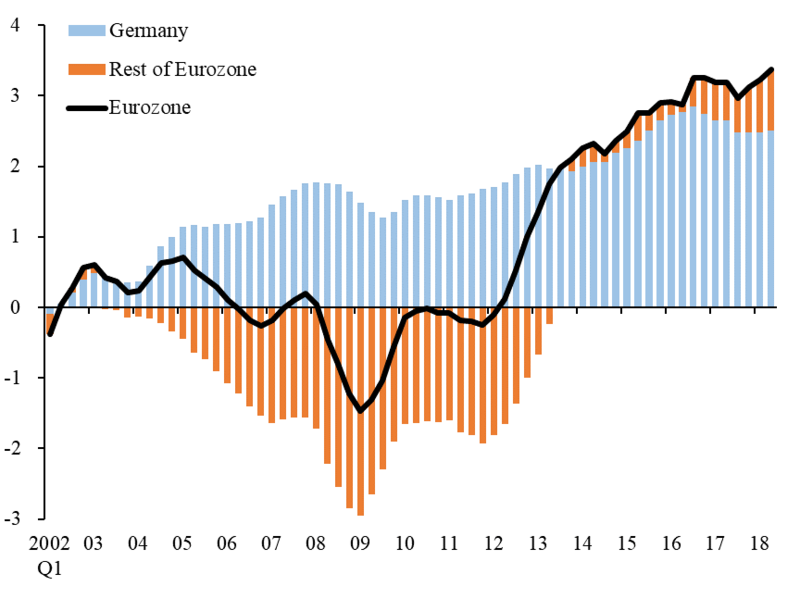 The current account deficits of the Rest of Europe is largely driven again by oil from 2004 to 2013, and surpluses are materially supported by the collapse of oil prices after 2014. So I think this whole discussion is way too monetary. If Japan’s population is falling, and it’s workforce is falling faster and can just be offset by productivity gains (ie, no GDP growth trend), then what should we expect to happen to real estate prices? Don’t these suffer secular deflation? If if the value of your house if just going to fall forever, what interest rate pairs with that? Let’s see who’s the smartest guy in the room. I am very quickly becoming an Ashoka Mody “fanboy” much in the same way I am a Menzie Chinn “fanboy”. Please don’t make fun of me—I attribute this “fanboy” hero-worship of “dry” professional economists to my socially awkward teen years. Oh wait, I was socially awkward long after my teens. What were we talking about again?!?!?!? This Ashoka Mody post is very well written and a super-enjoyable read. Certain parts jump out at you. 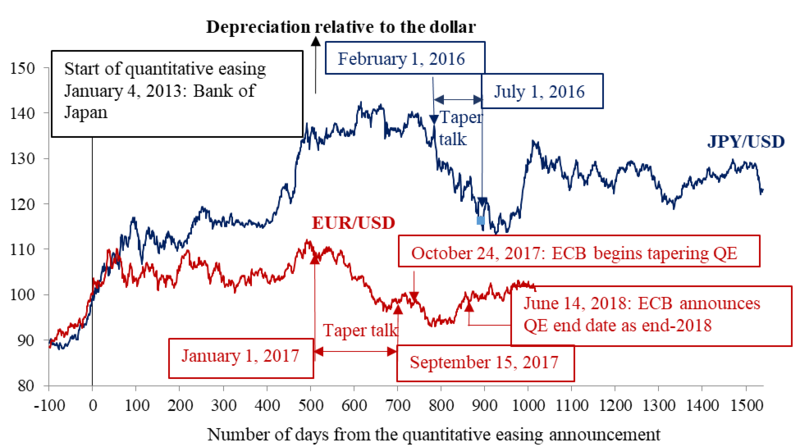 —ECB not as effective as BOJ (I assume the main focus here is in intentional depreciation of the home currency with trading partners). That’s a pretty bold statement. A strong statement. But it’s really hard to argue with (and I don’t argue it) after Ashoka presents the facts and graphs. —ECB raised rates in 2011 TWICE. WOW. I don’t even remember this and seems near unbelievable even now looking back at it. Who the F___ made that call?? In April Draghi wasn’t in, and in July Draghi had only been at head of ECB 1 month, yeah?? So we’re to assume this was mostly German influence on the ECB here?? Draghi doesn’t strike me as a guy “pushed around” very easily. Excellent post, Menzie . I’ve read widely on Mody’s website as a consequence. Ordered his book as well. Kudos to you, Askoha Mody! The first link covers Italy, the last 3 links are Yanis Varoufakis discussing the importance of democracy in Europe. A living legend. Wonder if Letterman will ever get him on his Netflix show?? “No Introduction Necessary” seems to apply. 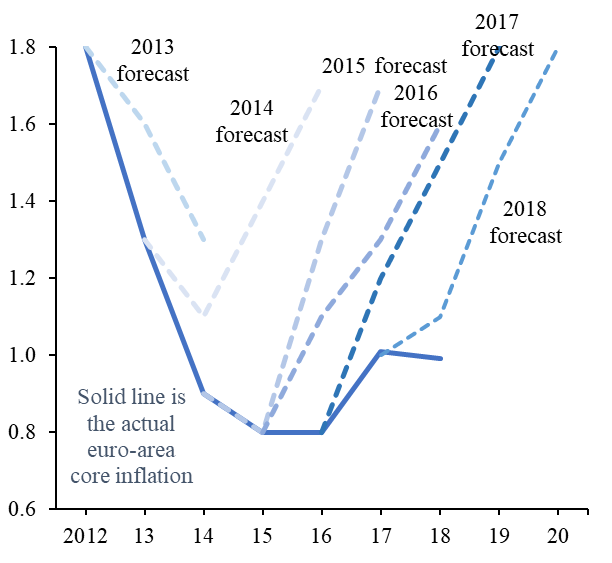 I don’t foresee the Fed tightening any time in 2019, but it’s not out of the question. If I was forced to wager I would say ZERO rate increases inside of 2019, but it’s not impossible. Deflation fear seems to be based on theoretical ideas with zero grounding in reality. 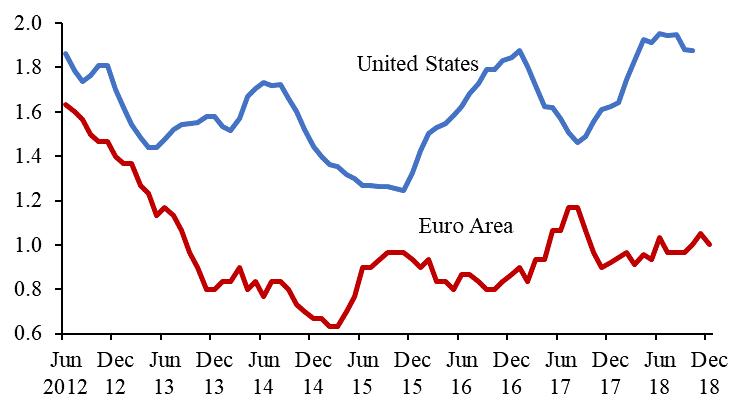 ” Although no eurozone country is facing outright deflation, lowflation raises the real interest rate, which causes consumers and investors to hold back on purchases, which holds back growth, which validates the expectation that inflation will remain low, which causes consumers to continue holding back on purchases.”. Please show research showing Japanese consumers held back purchases because prices were declining on average by 1%. I do not think anybody in Europe holds back purchases because of low inflation. For one few people think inflation is low. Just look at the Eurobarometer responses. 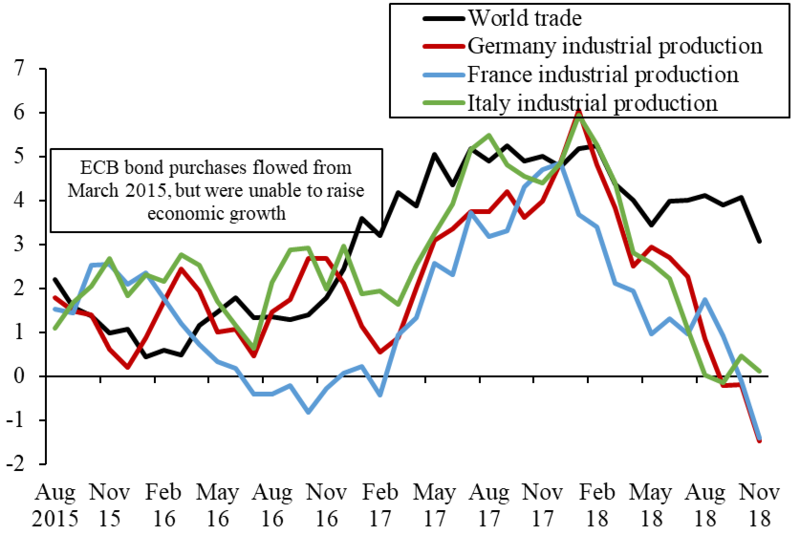 Very few respondents in the only country with some price declines for a while – Italy – thought prices were declining. The only purchases that are sometimes delayed in response to expected price declines are for more expensive goods showing technological progress or fashion (i.e. waiting for the sales season). I.e fear for mild deflation is based on nothing. 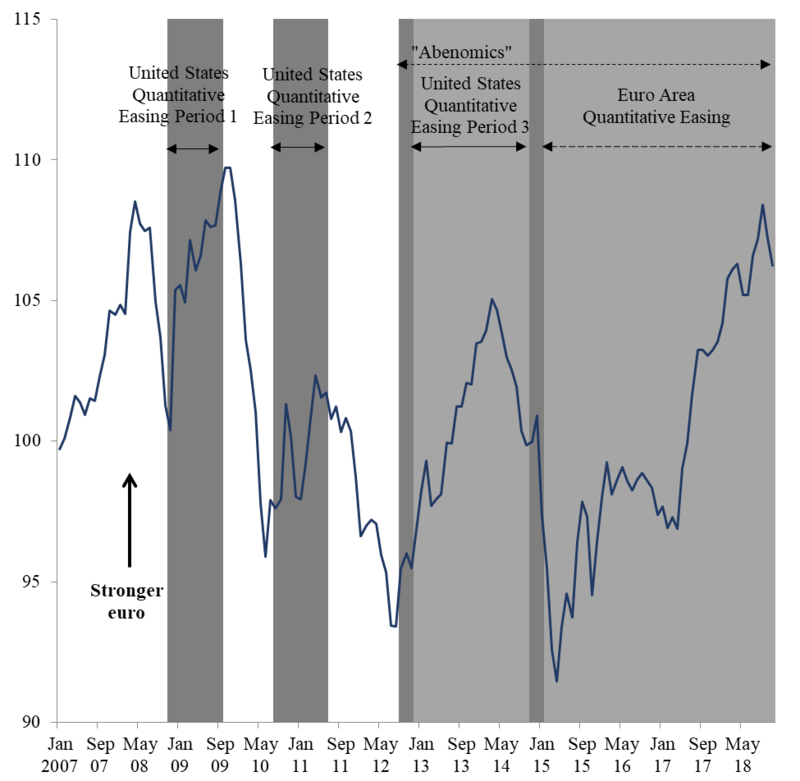 The Depression was quite different….huge price level declines in a short timespan and 25% unemployment….